The month of Ramadan is eagerly awaited by all Muslims and is observed with a passion and joy that is infectious. 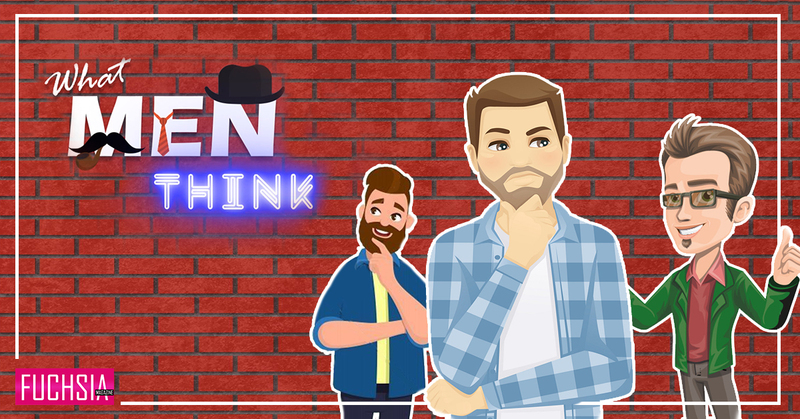 We all look forward to Iftar outings with family and friends, and introducing our non-Muslim loved ones to Ramadan, with Iftar at a nice restaurant. 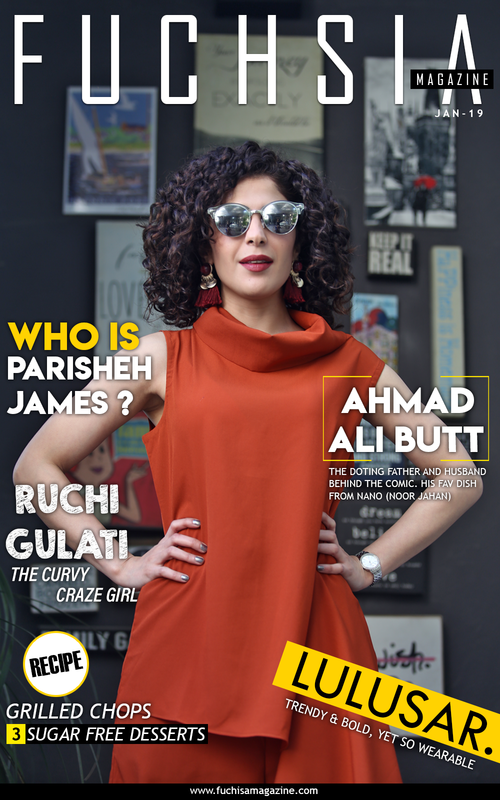 While fasting individuals do their bit in observing Ramadan, restaurants and eating establishments are not about to be left behind. Many eateries are offering special Iftar or Ramadan deals to be part of this special month. 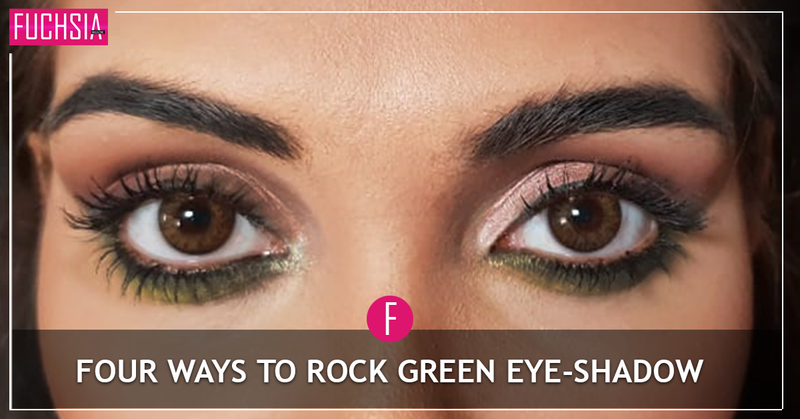 Team FUCHSIA has decided to be helpful, as always, and put together various Ramadan deals on offer, so you, our beloved readers, have them at your fingertips. 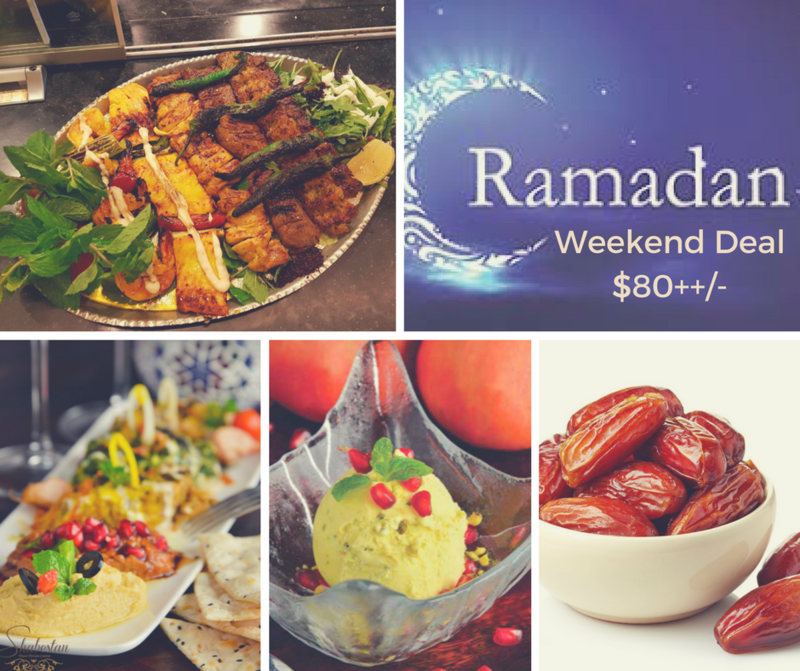 So read on, enjoy the deals and be sure to share this list with friends and family to spread the Ramadan spirit. Please ascertain status of the food to your satisfaction before consumption. Some of the restaurants mentioned in this feature are not Halal-certified but they do not serve pork or lard and they source their food from Halal suppliers. Some of them serve alcohol. A Pakistani restaurant, offering authentic Pakistani food including ChickenTika, Reshmi kebabs, biryani and karahi. 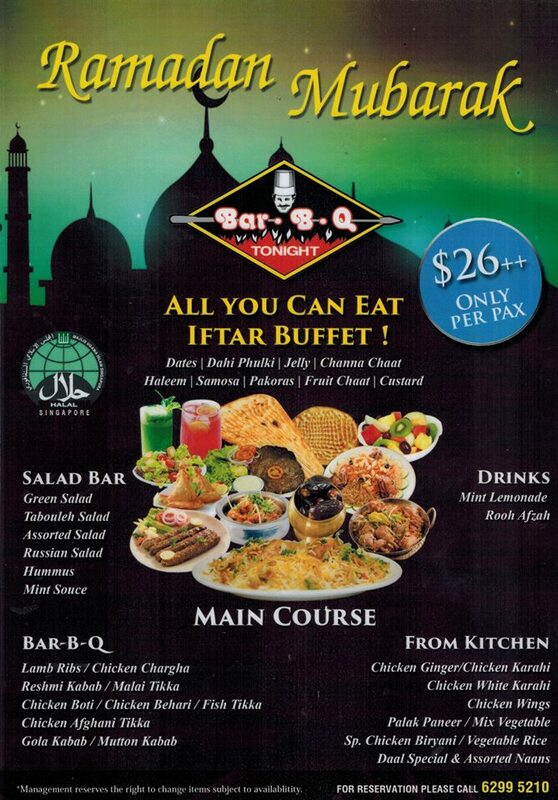 IFTAR OFFER: All you can eat Iftar Buffet $26/-++ per person. Offering lunch, dinner, coffee and drinks, the restaurant offers Mexican influenced fare with an indie cafe experience. 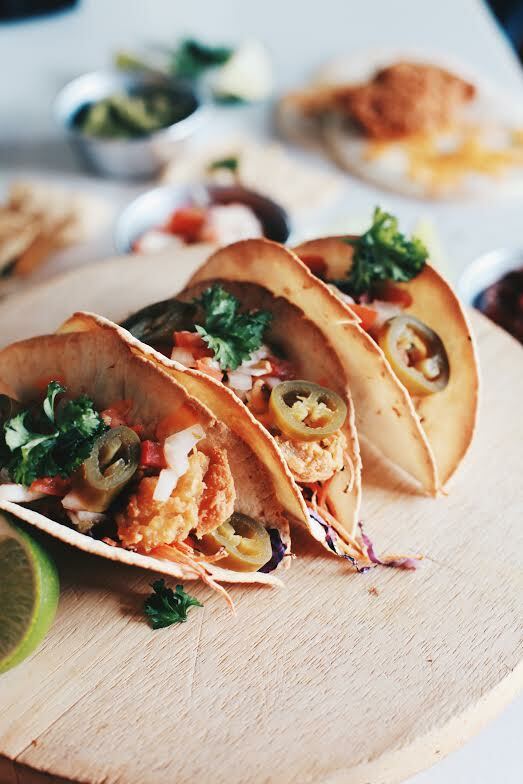 From punchy mock tails to house-made dessert tacos, there’s enough of that sweet sensation to go around. 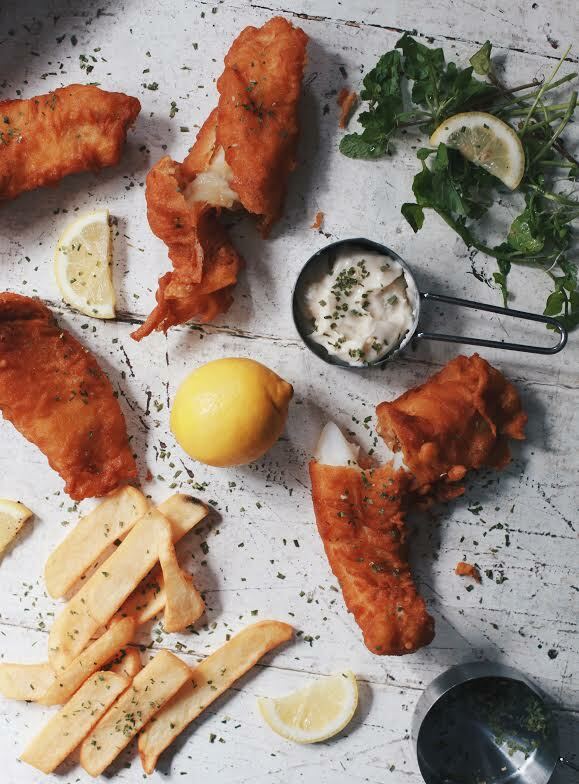 THE MAD SAILORS take on Halal British Cuisine, and serves breakfast, lunch, dinner, coffee and drinks. Fish and Chips from The Mad Sailors. Known for its sumptuous halal-certified buffet, AquaMarine is putting together an exclusive Iftar spread for Ramadan, from 24 May to 26 June 2017. On top of the International and Asian favourites, diners can look forward to special dishes such as the Wagyu Beef Oxtail Rendang, Grilled Salmon with Rempah and Spicy Coconut as well as Chicken and Jackfruit Curry. The chef will also be serving up the tantalising Balinese Roasted Whole Baby Lamb with Tamarind Pineapple and Chilli Dip, which is exclusively available on Friday and Saturday evenings. What’s more, dine with your family* and enjoy 30% savings when you present a printed 4R family photo. Terms and conditions apply. *Minimum of 4 persons and maximum of 8 persons per family. Located at city Square mall, this restaurant is a heaven for pancake lovers. With an extensive menu which includes Pancakes, Crepes and Galettes Pannekoek both savoury and sweet, this western Halal Family restaurant spoils you for choice. Iftar special: 5 main course for the price of 4. In addition to the above deal, they are also featuring Middle Eastern inspired cuisine. This menu will be exclusively available during the Fasting month. Located at Robertson Quay, Shabestan offers authentic Persian Cuisine. The mixed platter contains a different selection in weekday & weekend deal. Address: 80 Mohamed Sultan Road #01-13, Robertson Quay. Myra’s offers a variety of Mexican and north Indian cuisine. 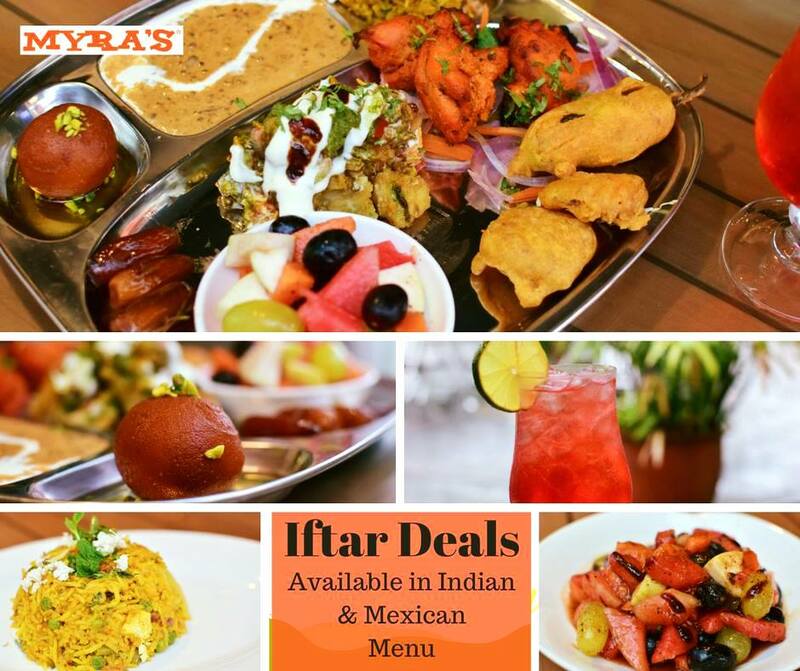 This Ramadan they are offering special iftar deals… both in Indian and Mexican menu. Branches at East Coast Park, Stadium , Fort Canning & boat Quay. Offering Malay and Indonesian cuisine, Hjh Maimunah Restaurant is known for its fine selection of Signature Dishes, including delectable and Juicy Sundanese Grilled Chicken, the tempting Lemak Siput and the wide varieties of barbecued fish. Along with that, dishes such as Sambal Goreng, Tahu Telur, Beef Rendang and Oxtail Soup are among the more-than-40 selections that you can choose at restaurants. Relive the beauty of Ramadan and bond with family and friends over a medley of halal-certified Iftar dishes, alongside live stations featuring regional and Middle Eastern favourites. The Iftar dinner buffet is available Sundays to Thursdays from 6:00pm to 10:00pm, and Fridays, Saturdays and Public Holidays from 6:00pm to 10:30pm. Heaven for halal conscious meat lovers, who crave for steaks. The French trained Chef Amri Azim keeps coming up with creative dishes. 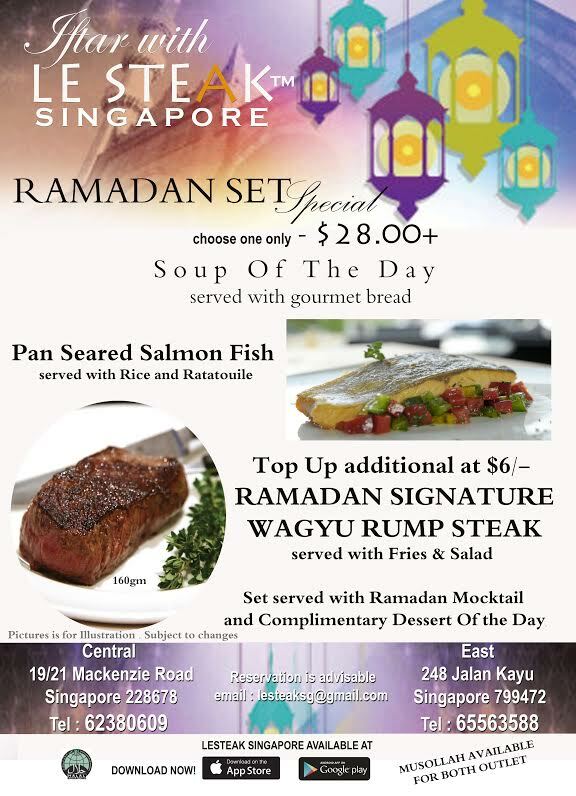 Their signature for ramadan is “wagyu rump steak “. Their current signature on the menu is premium Aus Wagyu Ribeye MS6 selling at $59 usual. The ever popular Straits kitchen is back with its Ramadan Dinner Buffet, offering Malay, Indian, Chinese and Arabic varieties. 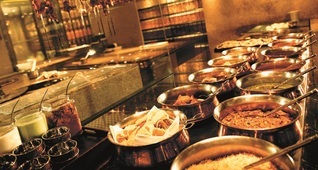 The buffet includes special Arab-style grills which include charcoal-grilled lamb, beef, chicken, prawns, and vegetables. You can also find other traditional Middle Eastern treats like Mohallabiah milk pudding and baklava. For the firts time, Straits kItchen also offers a take-home iftar set at S$312+ is suitable for sharing by four people. It will be available via the restaurant’s delivery services partner UberEATS, and also for self-collection at StraitsKitchen. Grand Hyatt, 10 Scotts Road. In Ramadan they have introduced pre-order Iftar to take away. 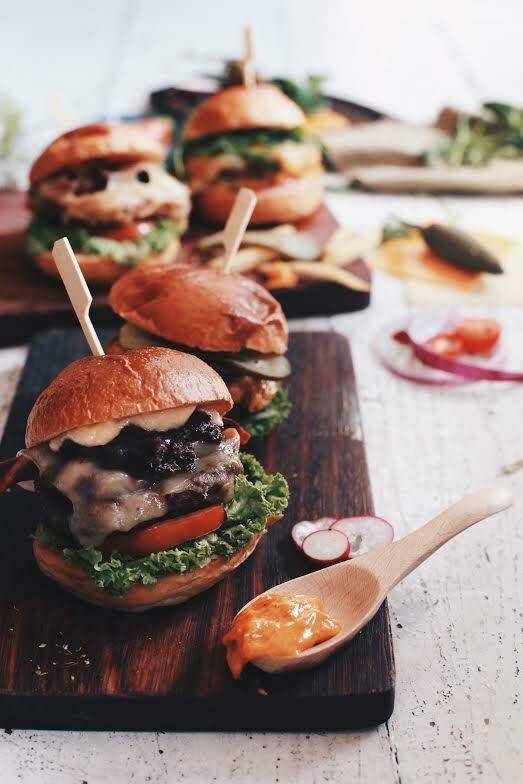 Pre-order your Iftar orders online before 4pm at order.hydeandco.com.sg and pick up between 430pm – 7pm. Azur located at Crowne Plaza Changi airport offers a lavish buffet (*halal-certified) consisting Seafood, Japanese Sushi and Sashimi, Cold Cuts selection, live stations serving Asian and Western cuisines including Chicken and Beef Satay, Roasted Beef Rib Eye, Grilled Lamb Chop on Ratatouille, Oyster Risotto and Pasta of the Day. You can also find Ayam Masak Merah, Beef Rendang, Assam Fish Curry, Wok-fried Prawns with Sambal Onions, Sayur Lodeh and Lontong and more. In addition the there are multiple delightful treats at the dessert buffet. Mon-Thurs: $55++ (1-for-1 dining deal), Child : $27.5/- ++. Fri – Sun: $55 nett, Child : $27.5/- nett. 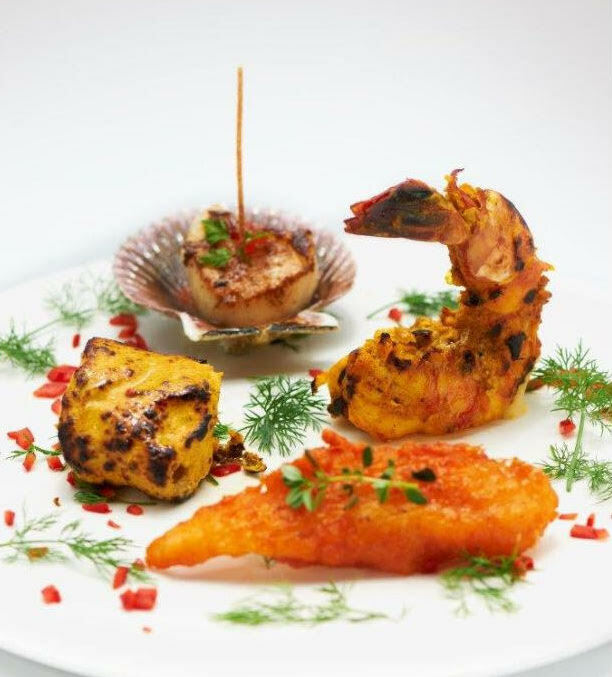 Located at The Shoppes at Marina Bay Sands, Punjab Grill offers Indian and middle eastern Cuisine. It also offers a 10 course Indian Degustation Menu. 2: Hari Raya chef tasting 5 course meal at 98++.